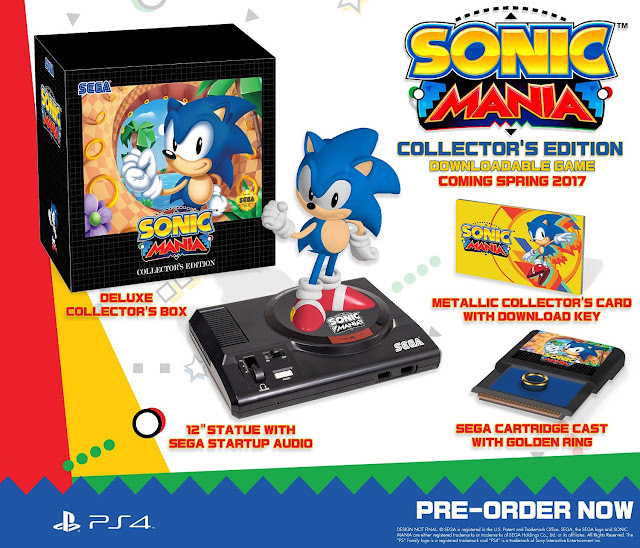 Sonic Mania is a return to the Genesis days of 16-bit 2D Sonic the Hedgehog. It looks like it came straight out of the mid-90s. You can play as Sonic, Tails, and Knuckles and battle Dr. Eggman's robot army through all-new Zones. Deluxe SEGA Genesis style box. 12" Classic Sonic Statue standing on a SEGA Genesis. It also has the classic SEEGAA startup sound built into the statue. SEGA cartridge case with a gold ring.